Car maker Dacia – Renault has launched the new Duster model in Romania, bringing Formula 1 champion Alain Prost to attend the event. 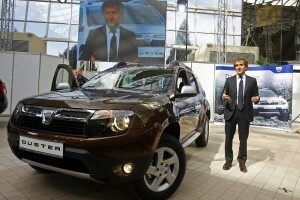 Duster is Dacia's first SUV model and prices range from EUR 10.500 for 4x2 model, to EUR 12,300 for the 4x4 model. “The Duster till consolidate Dacia's international expansion and will allow us to attract new clients […],” said Jerome Olive, general manager of Dacia. Duster is the sixth Dacia model and is produced in the car maker's factory at Mioveni, in Romania. The launch of the new model required EUR 290 million in investments, out of which EUR 70 million went to the Mioveni factory.